You can probably tell that this is an old picture. In fact, it was taken in 1955, the year I was born. It shows my grandparents and their children at a family reunion, in front of their farm house in Maine. 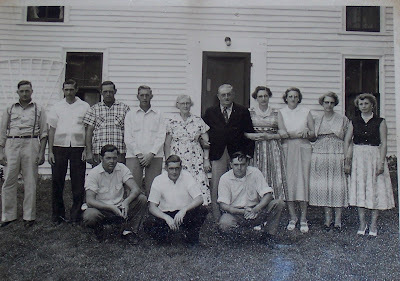 My dad was the youngest, the good looking one down in the front. The reason I'm posting this today is because I got word my Aunt Marjorie passed away. I'd only ever met her once, and that was years after my dad had passed away. Because of the age difference between her and my dad she wasn't around when I was a kid. Aunt Marjorie was the first born to my grandmother, the one holding my grandfather's arm. Kind of strange when you think about it. The first born was the last to go. And god love her, she was just shy of her 101 birthday! They're all gone now. The farm house was burned down long ago. Now there's just an empty lot with a cellar, and new trees planted by the new owners. Some day they'll build there I suppose. And make their own memories. Sorry to hear about your aunt Debbie. I love looking at the old photos. It's one way to keep their memories or the memory of them alive. :)How about them dresses from the fifties. And the hair styles too! I have tons of pictures taken over the years and like to look through them once in a while. Brings back memories both happy and sad.